Three basic Advanced Personal Computer III configurations are offered: a single 320K-byte floppy-disk drive system: a dual-drive system: and a system with an integrated 10-megabyte Winchester-disk and a single floppy-disk drive. All models have an 8-MHz NEC PD8086 (16-bit) microprocessor, 128K bytes of RAM. 8K bytes of nonvolatile CMOS memory, and 32K bytes of ROM for bootstrapping, diagnostics, and ROM BIOS. I/O facilities are made up of a Centronics parallel interface, an RS-232C port with both asynchronous and synchronous communications at speeds of up to 9600 bps, and monochrome and color (RGB) monitor interfaces. A hardware calendar/clock and IBM character sets are supplied. The Advanced Personal Computer Ill’s 61-key IBM Selectric-type keyboard is supplemented with a numeric keypad, cursor-control keys, calculation keys, and 12 user-definable function keys that can be used in five modes for 60 total programmed definitions. Both monochrome and color systems use 14-inch, reduced-glare monitors. The display format is 2 5 lines by 80 columns: character cells are 8 by 16 pixels. Graphics resolution is 640 by 400 pixels. The graphics option gives the system 64K bytes (monochrome) or 192K bytes (color) of dedicated memory. Each pixel can have any one of eight colors. The monochrome and graphics subsystems are based on the NEC 7220 graphics-display controller. Other options include up to 640K bytes of RAM, RS-232C and IEEE-488 interfaces, a memory-management unit that protects multitasking operations in the UNIX environment, and joystick interfaces and sound effects. The system runs all generic MS-DOS software in IBM 5-1/4-inch formats: a complete list of available applications software is available through CompuServe and The Source. A 256K-byte Advanced Personal Computer III with the floppy-/hard-disk combination, UNIX software, and UNIX hardware costs $5320. The UNIX software features a C compiler. RAND editor and Berkeley UNIX editor, 8087 coprocessor and emulation, coresidence with MS-DOS on hard disk, file transfers to and from MS-DOS, and C-Shell from Berkeley UNIX. The single-drive system with a 14-inch monochrome monitor is $1995. A monochrome system with the hard- and floppy-disk combination is $3995. For more information, contact NEC Information Systems Inc.. 1414 Massachusetts Ave. Box-borough. MA 01719. (617) 264-8000. 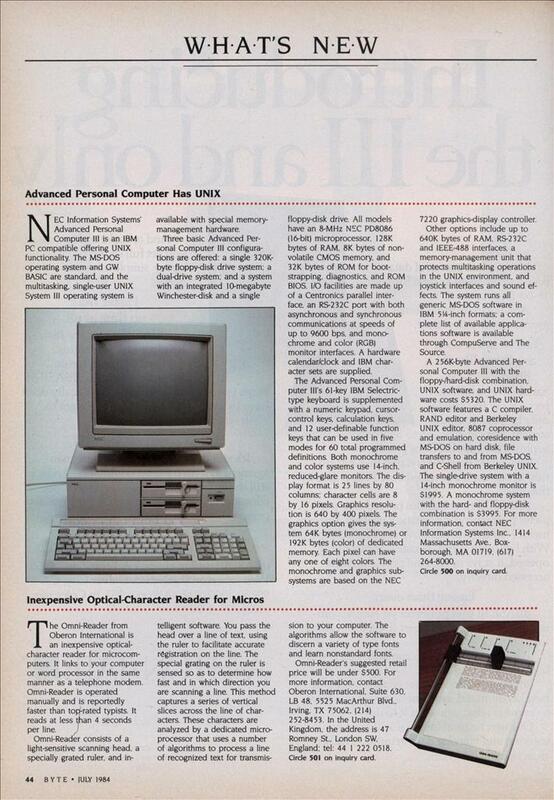 Inexpensive Optical-Character Reader for Micros. The Omni-Reader from Oberon International is an inexpensive optical-character reader for microcomputers. It links to your computer or word processor in the same manner as a telephone modem. Omni-Reader is operated manually and is reportedly faster than top-rated typists. It reads at less than 4 seconds per line. Omni-Reader consists of a light-sensitive scanning head, a specially grated ruler, and in- telligent software. You pass the head over a line of text, using the ruler to facilitate accurate registration on the line. The special grating on the ruler is sensed so as to determine how fast and in which direction you are scanning a line. This method captures a series of vertical slices across the line of characters. These characters are analyzed by a dedicated microprocessor that uses a number of algorithms to process a line of recognized text for transmis- sion to your computer. The algorithms allow the software to discern a variety of type fonts and learn nonstandard fonts. Omni-Reader’s suggested retail price will be under $500. For more information, contact Oberon International, Suite 630, LB 48, 5525 MacArthur Blvd., Irving. TX 75062. (214) 252-8453. In the United Kingdom, the address is 47 Romney St.. London SW. England: tel: 44 1 222 0518. Otrona’s PC-Compatible Portable Easily Converts to Desktop Computer. The Otrona 2001. a portable computer that easily converts to a desktop system, is fully compatible with the IBM PC. Its architecture offers three PC-compatible expansion slots, and its operational compatibility embraces all IBM software, such as Lotus 1-2-3 and Multiplan. The basic Otrona 2001. retailing for 52495. comes with a single 48-tpi 360K-byte floppy-disk drive, a 4 77-MHz 8088 microprocessor. 128K bytes of RAM with parity. 64K bytes of ROM with diagnostics, a 7-inch amber flat-screen display, a serial RS-232C asynchronous port, a parallel port, and a composite-video/RGB external monitor interface. The low-profile. 84-key DIN 30-mm keyboard is equipped with 10 function keys, a 15-key numeric pad, uppercase/lowercase LED indicators. and a 16-keystroke buffer. The display format is 80 by 25 with a standard resolution of 640 by 200 pixels. The Otrona 2001 weighs 19 pounds and measures 7 inches high. 15 inches wide, and 14 inches deep. Expansion options include a 10-megabyte internal hard-disk drive, a second 5-1/4-inch floppy-disk drive, up to 640K bytes of RAM. a 4.77-MHz Z80B microprocessor with CP/M, an 8087 mathematic coprocessor, realtime clock, internal 300/ 1200-bps auto-dial modem, high-resolution (640 by 200) graphics board, and additional asynchronous and synchronous I/O ports. A 7-inch P-31 green-phosphor monitor, a 12-inch color display, a dot-matrix printer. DC power supply, a travel pack, and a PC-compatible expansion chassis are also available. Otrona offers Microsoft MS-DOS version 2.1 with Disk Manager 2 and GW BASIC. CP/M 2.2. and BASIC-80 Plus as system software. The Otrona 2001 is available for immediate delivery. For the name of your nearest dealer, contact Otrona Advanced Systems Corp.. 4725 Walnut St.. Boulder. CO 80301. (800) 525-7550; in Colorado, (303) 444-8100. A hardware/software combination to expand the IBM PC into a multiuser system. StarLink from Digital Research provides a low-cost alternative to purchasing multiple computers. With StarLink. you can connect four terminals or microcomputers to your IBM PC. with users sharing files, data, and applications. 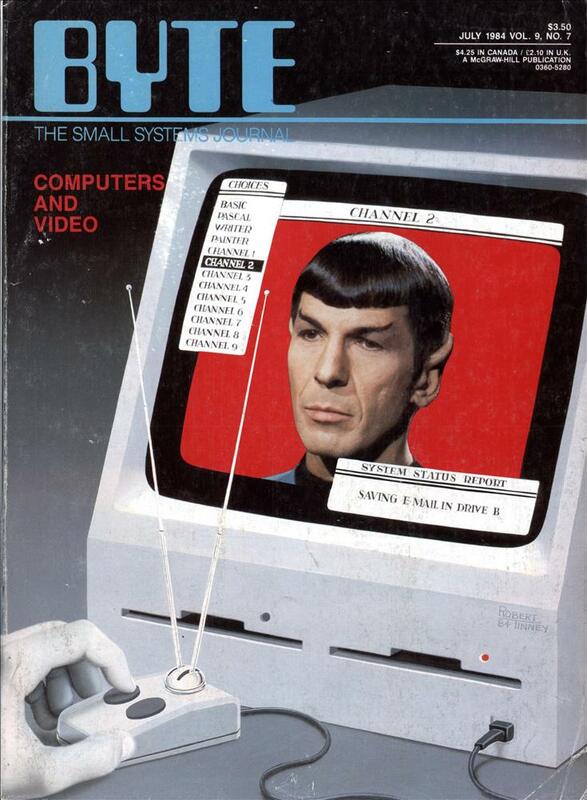 StarLink is made up of an 8088-based board, 64 K bytes of RAM, and Concurrent PC-DOS (see announcement on page 50). Its on-board RS-232C interface lets you use the IBM PC along with terminals, modems, and computers from other manufacturers. The operating system has protection and file-locking functions. StarLink can run such applications programs as WordStar. MBA Accounting, and Multiplan. It requires an IBM PC. PC XT, or PC compatible with 512K bytes of RAM. The list price is $1695. Contact Digital Research Inc.. 160 Central Ave. Pacific Grove. CA 93950. (408) 649-3896. Light Pen Works with Apples. The Gibson Light Pen. available from Koala, lets you create and manipulate objects on the Apple’s screen. It’s easy to judge and control the Gibson Light Pen because it comes in direct contact with the screen. Color can be added or changed as often as you like, and you can choose from a variety of presupplied colors and patterns to paint areas of your art. The heart of the Gibson Light Pen is software. Four programs come with the pen. and Koala intends to expand software offerings in the future. The programs are PenPainter. PenAnimator. PenMusician, and Pen-Designer. PenPainter is a color graphics program for artistic applications. PenAnimator serves as an introduction to animated computer graphics. It lets you create 20 frames of animation that can be cycled through the monitor. PenMusician shows you how to score simple melodies. It uses the Light Pen for moving notes across the staff lines, and it plays back the melodies. Pen-Designer is a black-and-white line art program for technical or business graphics. It provides the means for producing professional-quality graphics. The Gibson Light Pen is currently being shipped for the Apple II series System requirements are 64K bytes of RAM. Applesoft in ROM. DOS 3.3. a disk drive, and a monitor. Versions for the Commodore 64 and the IBM PC and PCjr are expected by year’s end. It lists for $249. Further information is available from Koala “technologies Corp.. 3100 Patrick Henry Dr.. Santa Clara. CA 95052-8100. (408) 986-8866. It’s easy to forget that Unix once was really _expensive_. “The Otrona 2001. a portable computer”, at almost 20 pounds you notice they said portable, not laptop. The CRT was the last vacuum tube in regular use with computers and the last part to go solid state. Notice the clock speed: 4.7 MHz! I think I could make it go faster if I stepped outside and pushed! @Kosher — to be pedantic, is it valid to call LCD displays “solid state”? I guess the LCD panels may get a pass (along with electrolytic capacitors), but CCFL backlights would seem to me to be very much a vacuum tube technology by most any reasonable definition. On a non-pedantic level, you’re absolutely correct, of course. UNIX with 256KB of RAM must have been very limiting. Minix 1.x needed something like 512 KB at a minimum on the 8086/8088, and I think would be roughly comparable in scale to the UNIX described. @DrewE: You’re basically right on the backlight portion – but eventually even that will be moot, as LCDs are moving to LED backlighting (and I would imagine that eventually, larger OLED displays will be common – no backlight needed). 3 to 4MHz was very fast back then. Programs were responsive. The Apple II was only running at 1MHz at that time. Most applications were just alphanumeric. Very little graphics. It’s all relative. Audio – Beeps and Boops Apple originally handled the copyright name with the Beatles by stating that their computers had nothing to do with music since it was considered almost impossible to handle music at that time. Well only going from DOS to UNIX already must have improved the use of the machine a great deal, since UNIX has all those nice features like a proper shell and file-system, along with lots of standard tools like awk and sed. Actually it was very well possible to do audio on those machines, but few people had d/a converters. Plus storage was a problem. No mention of the Light Pen. That Gibson is the same Steve Gibson of Gibson Research, maker of Spinrite, and the co-host of Security Now. Steve invented that form of light pen.